For all but one song we used the arrangements in a cantata book we had, “All Through the Night” by Greg and Gail Skipper, arranged by Stan Pethel. This gave very simple arrangements with unison or two-part harmony throughout. You could just use the songs in their original arrangements or choose similar songs. Four wrapped packages. 1. an exercise ball wrapped in a box that looks like it could be a TV. 2. some carrot seeds wrapped in a box that looks like jewelry. 3. a book with the title Aliens on Planet Tupperware. 4. a bike lock in a very ordinary package. I wrote this program to fit the people we had in church at the time and the music we already owned. Feel free to make changes to meet the needs of your church or group. Youth #1: Look! Mom put some presents under the tree. Youth #2: Look at that big one! It’s huge. I hope it’s for me. Youth #3: The little one might be better. Haven’t you heard that big things come in little packages? Youth #4: I asked Mom and Dad for a new bike but that package isn’t big enough to be a bike. Youth #2: (Looking at tag on big box.) Hey, it’s for me. Maybe it’s a TV. I wouldn’t mind having a TV in my bedroom. Youth #1: You guys might be expecting too much. Dad keeps talking about how prices have gone up. I think we’re going to have a cheap Christmas this year. Youth #4: They’ll never get [Youth #2’s name] his own TV, but I could ride a bike to school and save them gas money. Youth #3: (looking over presents) Look, the little one’s for me. I don’t want a big present. I just want one from [name a jewelry store.] Anything in 24-carat gold works for me. Youth #1: I asked Aunt Abby for a [name a computer game.] I told her it would give the adults peace and quiet for Christmas. How can she resist with logic like that? Youth #2: Here’s your box. To: [Name #4.] From: Mom and Dad. Youth #4: That doesn’t look very exciting. I hope it’s not underwear or socks. Youth #3: That’s the bad part about Christmas. If you get your hopes too high you come away disappointed. Maybe we should all hope for socks and underwear. Then we’ll be really happy if we find out we’re wrong. Narrator: Christmas is a great time of year, but sometimes it doesn’t live up to our Great Expectations. The very first Christmas was a time of expectation too. Old Testament prophets waited hundreds of years for their Messiah, their Savior King, to come to earth. God had already revealed some things about this Messiah. But no one expected the level of humility Christ would display in His simple birth in a Bethlehem stable. Old Testament scholars may have had little idea what Messiah would be like, yet they awaited his coming with great expectation. Narrator: God’s perfect time arrived. Heaven poured out its wealth as God’s own Son left His throne in Glory and stepped down to earth. But men would soon learn that Jesus would not be what they expected. Jesus came to the humble little town of Bethlehem in the form of a tiny baby. Narrator: According to God’s plan, God the Son began His life on earth in the womb of a young Jewish virgin. Mary offered her body to God to be used in this way. Joseph married Mary and pledged to care for this special child. In those days Caesar Augustus decreed that all people must return to their birthplace to register and be taxed. This decree required Joseph and Mary to make a long difficult journey to Bethlehem. When they arrived all the inns were full, forcing them to stay in a dusty stable. This wasn’t the birthplace anyone would have expected for God’s own Son to enter the world. But according to God’s plan, the baby was born in the dusty stable. Narrator: What joy Joseph and Mary must have felt at the birth of this precious child! But Mary grew weary and finally took a well-deserved rest. Carefully she placed him in a feeding trough filled with hay. While Mary and Joseph rested, Jesus was well-looked after by a watchful host of angels. Sleep dear Child and peace attend You all through the night. Guardian angels God will send You all through the night. God His watchful care is keeping all through the night. Jesus, look inside my heart and see deep within. Please forgive each sinful part and new life begin. How His Son can bring us healing from all our sin. Narrator: Joseph and Mary didn’t have to wonder what to call their newborn son because an angel had appeared to Joseph in a dream to explain the miraculous birth. Joseph: We’ll call him Jesus, just like the angel said. Mary: Jesus means Saviour. Will Jesus really save people from their sins? Joseph: That’s what God said! Narrator: Meanwhile a group of shepherds watched their sheep on a nearby hillside. Suddenly the stars disappeared, lost in the overpowering light of God’s glory. An angel appeared and spoke to the shepherds. Other angels joined in the birth announcement. Angel #1: Don’t be afraid. I bring you good news. Angel #2: Today a Savior is born in Bethlehem. You will find him lying in a manger. Narrator: Suddenly angels filled the sky with their praise. Angels: Glory to God in the highest, and on earth peace, goodwill toward men. Shepherd: Let’s go to Bethlehem now and see this great event. Narrator: The shepherds hurried from the hillside to find Baby Jesus. After hearing the great angel chorus in a sky bright with God’s glory, they must have expected another spectacular display when they came to the Christ-child. Instead they found an ordinary stable. The animals may have lain nearby. The couple was simply dressed and their appearance was unimpressive. And in the musty hay of the feeding trough lay what looked like an ordinary Baby. Though the scene probably wasn’t what the shepherds expected, they knew that the simple setting held God’s gift to mankind. That ordinary-looking Baby was God the Son. He would grow into the perfect Man and offer us the perfect gift of salvation. At great cost He would purchase our salvation with His own life. Prophets told a king victorious would descend to bless the earth. Yet the Son, so strong and glorious, came to us in humble birth. Jesus! Saviour! Let us praise His matchless worth! What a wondrous, blessed story! Such a show of God’s great grace. Jesus left His throne in glory, came and took a servant’s place. Stepping down he came to save a fallen race. Look at Him. The sight is glorious. See the Man of Sorrows now. Christ the King Who reigns victorious, crowned with glory on His brow. Now exalted, every knee to Him shall bow. 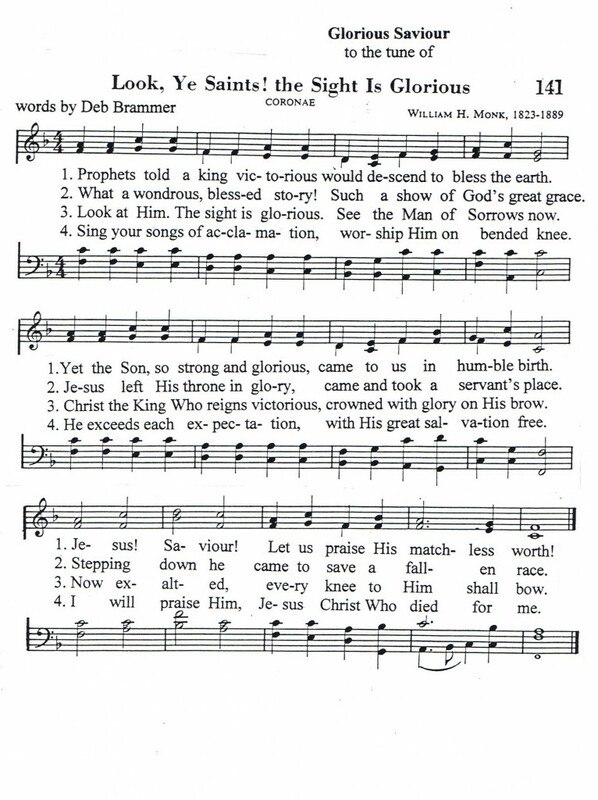 Sing your songs of acclamation, worship Him on bended knee. He exceeds each expectation, with His great salvation free. I will praise Him, Jesus Christ Who died for me. Dad or Mom: Since it’s Christmas Eve you can each choose one package to open. Youth #2: (opens big box which is not a TV, but an exercise ball. Trying to be thankful) Oh. You’ve been telling me I need to exercise more. That’s not what I expected. Uh, thanks, Mom. Youth #3: (opens little box which is not jewelry, but carrot seeds. With disappointment) Nana has been telling me I should start my own garden. Instead of 24 carat gold, I guess I’ll have 24-carrot orange. Dad or Mom: [Name #1], you guys have been talking a lot about space aliens lately. I think you’ll like Aunt Abby’s gift. Youth #1: (opens box which is not a computer game, but a book. Reads label) To [Name #1], from Aunt Abby. (Opens present) A book. Aliens on Planet Tupperware? Dad or Mom: Books are better than computer games. You can create your own worlds. Youth #1: (without enthusiasm.) Yeah. Well, that’s not what I expected. Dad or Mom: Tomorrow we’ll open the rest of our presents. I’m sure we’ll all get something fun. But [name Youth #4] still has to open his present. Youth #4: (opens box which is not underwear but a bike lock. Half-heartedly) Nice bike lock, but I don’t think anyone will try to steal that old bike of mine. Dad or Mom: Maybe you’d better look in the garage. Youth #4: (walks to imaginary garage door and looks out) Wow! A mountain bike! Is that for me? Dad or Mom: Yeah. Do you think it will get you to school and back? Youth #4: Sure! That’s not what I expected either. That’s even better than I expected! Narrator: Christmas is often a time of Great Expectation. Sometimes it’s also a time of great disappointment. Sometimes the best presents come in ordinary wrapping. We hope this Christmas is a warm and wonderful time for you. More than anything we hope you will find the best gift ever, salvation through Jesus Christ, God’s Son.